Writer’s block is traditionally not very cinematic. After all, movies are supposed to depict things happening, and this is specifically about something not happening. And yet, writer’s block is a theme the movies have returned to many times. 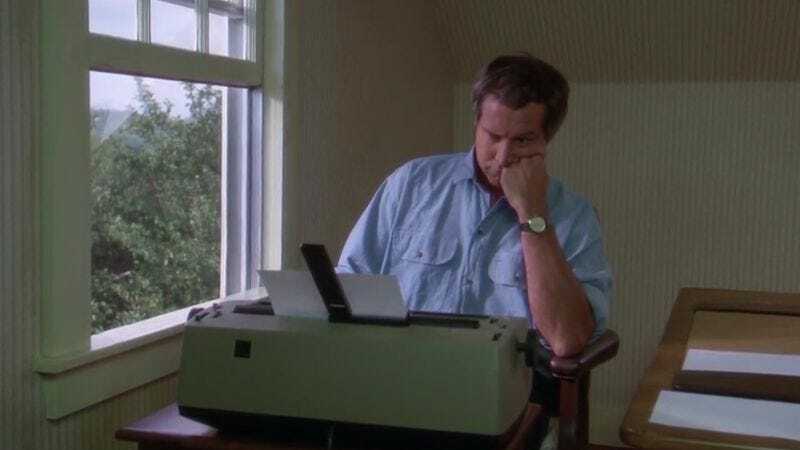 Now, Ben Watts and Ivan Kander have curated cinema’s best moments of creative frustration into “Writer’s Block: A Super Cut.” Here, in four maddening minutes, are all of moviedom’s writers who can’t write. Or, at least, who can’t write at the moment. Poor Jack Nicholson comes down with this ailment in at least two movies, The Shining and As Good As It Gets. Other sufferers include Nicolas Cage in Adaptation, John Turturro in Barton Fink, Charlize Theron in Young Adult, and poor Billy Crystal in Throw Momma From The Train. (The word Crystal is looking for is “sultry,” but he never figures it out on his own.) Kander and Watts end their supercut on an optimistic note, however, with a series of scenes of writers conquering their respective blocks. Writer’s Block - A Supercut from Ben Watts on Vimeo. One thing this supercut proves again and again is that typewriters make wonderful little character actors. The keys click and clack. The bell dings. The carriage moves back and forth. They’re very dramatic machines. Much of this video is devoted to long, lingering closeups of these now obsolete devices. Somehow, watching a writer stare longingly at the glowing screen of a laptop computer just isn’t the same. Plus, typewriters involve actual, physical paper, which makes for another great prop. A badly blocked writer can rip the paper out of the machine, crumple it up, and toss it into a wastebasket. In fact, there’s a whole series of wastebasket shots here, too. Their day may be over, but typewriters have made terrific contributions to the world of cinema.